Parents dread road trips most of the time. "Are we there yet? ", echoes incessantly from the backseat. The occasional, "I'm bored" arriving almost immediately after. This is the wrong way to tackle a road trip. As we start our journey South tomorrow, I thought I'd share some of the ways we make it fun! Honestly, I am looking forward to getting out of our current accomodations. This room smells like the floor of last night's party! Each time I walk into the hallway, I do a double take awaiting Danny driving his big wheel yelling, "red rum!" West Virginia here we come! It's our first stop along the way. First of all, there are rules on our road trips. Nobody is allowed to ask about the trip itself, unless there is educational purpose. That irritating question or that statement from above is not tolerated. We give the kids the time we'll arrive and let them figure out on their own how much time is left. Otherwise the trip is longer each time they ask. We have specified snack times as well. Otherwise everyone eats at different times and nobody's hungry when we stop and everyone has to pee at a different time. No way Jose! 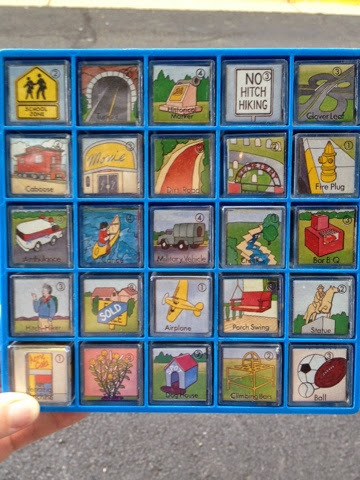 We inherited THE WORLD'S GREATEST TRAVEL GAME from my husband's parents a few years ago. 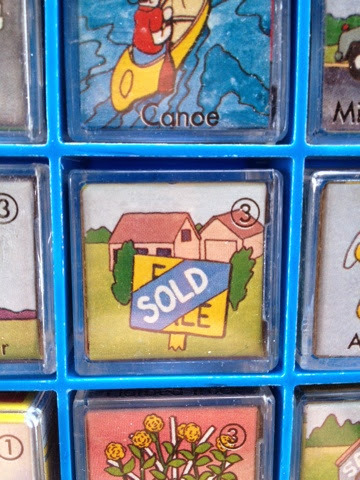 It's a grid of plastic blocks with pictures of items that you have to find along the way. It's kind of like travel bingo, but better. Granted it's a game that we want to update because it's tough to find a public phone nowadays, but the rest of it is great for keeping our minds occupied. We typically compete as parents versus kids and we parents are better! We also play a couple of other games. The license plate game is a classic that still works. This is a long trip, so it should be a very good collection by the time we arrive in Louisiana. One kid will be in charge of keeping track of the states. The other kid gets to keep track of the road kill log. I borrowed this idea from a dear friend who moves more than anyone I know courtesy of the NAVY. We dance! We are going to listen to soccer games! We will play the alphabet game too! My kids are good travelers. There is no DVD player in our car and there never will be because they can be barfers from time to time. Though I consider us "old school" car trip people, the kids do get to play on their devices from time to time. This is a 20 hour trip total. We're going to need them! Surely we'll have frustrated moments along the way. I am simply convinced that the better prepared we are, the better this trip will be. There's no reason to dread this unless I leave my bag of tricks in this brewery. Exit from this icky palace cannot happen fast enough.